Julie McEvoy has been mourning the loss of her mother most of her life. Only... her mother isn’t dead. She’s not missing. She’s not even far away. She’s just not there the way a mother should be. Having enough of the passive-aggressive loop their relationship has been on, Julie cuts ties completely with Cynthia. It shouldn’t matter; Cynthia’s never really there for her anyhow. She doesn’t need her mother anymore. Cynthia McEvoy has been keeping secrets for over thirty years. She’s not proud of it, but it has helped her to become the strong, independent woman she is today. The same strong woman who is now trying to pick up and glue back the pieces of the relationships she’s either destroyed along the way or never allowed any nourishment for. Hopefully, it’s not too late. Sometimes you have to go back to the beginning to understand how behaviors start, why they continue for so long, and where to begin the healing process. Author’s Note: At this point, I recommend reading this series in order, as it recaps situations from previous books and leads into the next book's (Ava's) story line. Showing Up is the fourth book in the GEG (Green Eyed Girls) series. Each installment follows a different girl, but they are all connected – please read these in order. I have loved each book for different reasons, but each are humorous and quirky. This particular story is about Julie and Blake, or so I thought. Yes, they are featured, but this is a story about the strained relationship between Julie and her mother, Cynthia. While we do get to see the GEGs in their glory, I felt this book took on a totally different tone. This was more introspective. This was a different love story; don't get me wrong – there is romance and a touch of erotica, but this is the story of loving oneself. Finding one’s self, and healing the wrongs done to others. Personally, this wasn't my favorite book in this series. Julie and Cynthia's relationship has been difficult from day one, but I just wasn't invested in Cynthia's story. I did like how Cynthia was tied to Julie and Blake, and there were cute parts. Overall, I felt like much of this book was forced, it didn't flow like the others. I am interested in finding out what's going on with other characters, specifically Ava and Trent. I actually have many questions that were brought up in Showing Up that weren't answered. Even though this book wasn't my favorite, I'll definitely continue with the series. This is the fourth book in this series, and I really would recommend that you read them all in order. Ideally all together – I’ve read them as they came out, and four years on from the first, it took me a few chapters to get fully re-immersed in the madness that is this group of friends. But after that I flew through it, so happy to get to catch up with them all, and finally get everyone back on an even (for them) keel. We reunite with all the couples and see how they are moving forward with their lives. Julie, her mother, and her Brit, Blake, may be the headliners, but all of the gang and their parents are essential to the story. 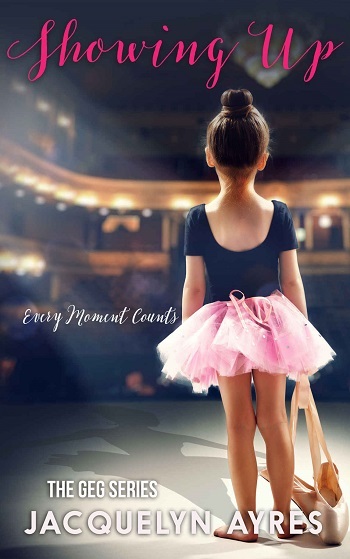 There are some truly poignant moments – although often dealt with in a raucous fashion – which are a pointer to what really is important, and what really isn’t. We also understand much more by the end, of how someone for all the best reasons does the most terrible things. I didn’t cry, except with laughter – Ms. Ayres has an amazing talent with the outrageous and absurd; I think I may be a little in love with that part of her. I fear that if you read this cold, you will miss a huge chunk of why it is so brilliant, so please, don’t shortchange yourself and read them all. I have them all in my re-read collection, waiting for a time when I need to laugh and smile, and remember that life is in many ways absurd! For reviews & more info, check out our stop on the Under Contract Blog Tour. 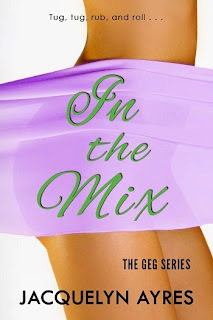 For reviews & more info, check out our stop on the In the Mix Blog Tour. For reviews & more info, check out our stop on the Crossing the Line Blog Tour. I am a domestic engineer (born and raised in New Jersey) whose sole responsibility is guiding three young, impressionable kids into becoming phenomenal adults. This challenging yet rewarding work requires a lot of love (coffee), patience (wine), and determination (periodic exorcisms). And so far—I’m nailing it! I used to work all of this magic from the beautiful state of New Hampshire but am now blessing North Carolina with my brand of harmless crazy. You’re welcome, North Carolina. Before becoming a domestic goddess (not really), I spent over a decade working in the medical field, where I wore more hats than the queen. 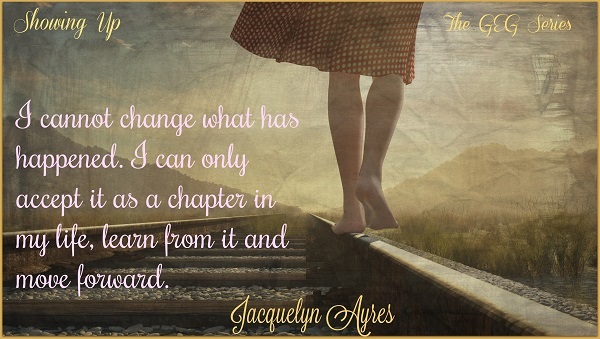 I have loved the written word and the great escape it provides since I was a little girl. When I wasn't reading about people and the places they lived, I created my own characters and adventures. Finally, I started putting a pen to paper and allowing my characters to come to life. When I don't have a pen in hand, you can often find me laughing at the conversations my characters are having in my head. 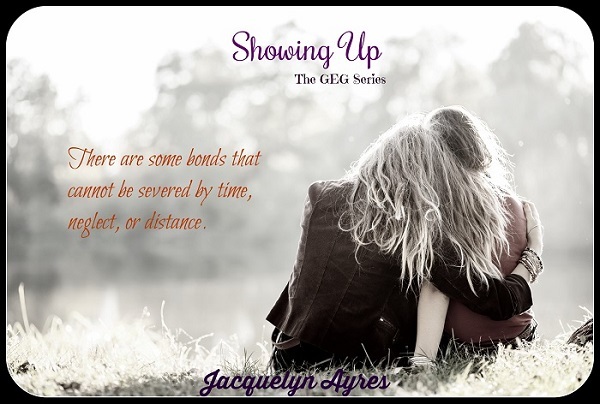 Reviewers on the Wicked Reads Review Team were provided a free copy of Showing Up (The GEG #4) by Jacquelyn Ayres to read and review for this tour.